RENO, Nev. (April 2, 2019) – Long-time Gary Platt customer Tamarack Junction Casino & Restaurants has upgraded its entire casino floor to Gary Platt’s patented Monaco chair. 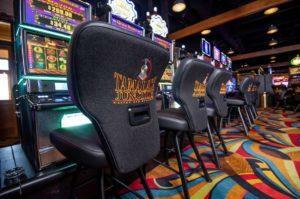 Tamarack Casino has been a Gary Platt customer for more than 17 years. When Tamarack wanted to refresh its casino floor, they turned to Gary Platt to create a custom look for the Monaco that perfectly blended the chair’s unsurpassed comfort with Tamarack Casino’s unique brand. Gary Platt’s Monaco chair is available in a wide range of customizable configurations for every part of the casino, including slots, tables, and sportsbook. Visit garyplatt.com to learn more about the Monaco and all of Gary Platt’s seating and design options. Visit Gary Platt in San Diego at NIGA 2019 in booth #2124 and join Gary Platt online at garyplatt.com and on Facebook, LinkedIn, and Twitter.